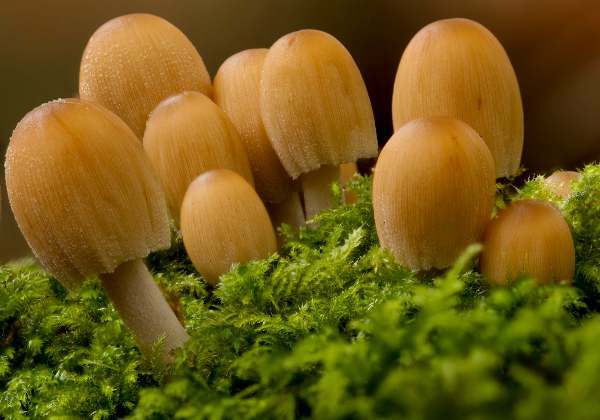 From tree stumps or buried wood of broadleaf trees, Coprinus micaceus, formerly known as the Mica Inkcap but now called the Glistening Inkcap, arises in small to medium-sized clumps from spring until early winter. This edible mushroom is potentially poisonous if collected from roadsides or polluted land, where the mycellium can bioaccumulate heavy metals such as cadmium and lead; this results in the mushrooms containing high concentrations of these toxins. 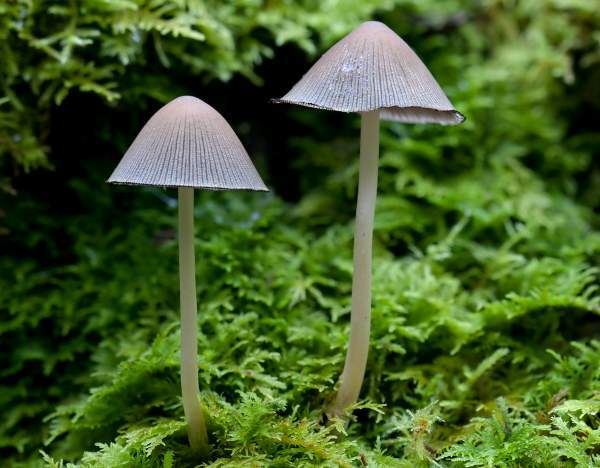 Common in Britain and Ireland and throughout Europe and North America, the Glistening Inkcap is truly a cosmopolitan mushroom, being found also in most parts of Asia and in South America and Australia. 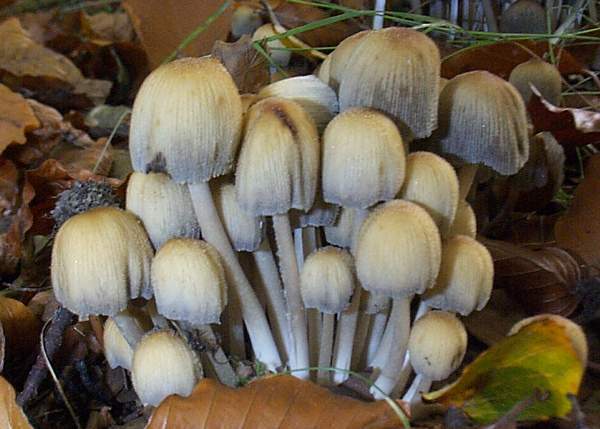 Coprinellus micaceus usually appears in quite large clusters and very rarely as solitary specimens. Synonyms of Coprinellus micaceus include Agaricus micaceus Bull., and Coprinus micaceus (Bull.) Fr. As Glistening Inkcaps mature the caps become bell shaped and then begin deliquescing from the margin inwards, as seen here. The generic name Coprinellus indicates that this mushrooms genus appears to be (or was thought to be) similar to fungi in the genus Coprinus, which literally means 'living on dung' - that's true of quite a few of the inkcaps but not particularly apt for this and several other Coprinellus species. 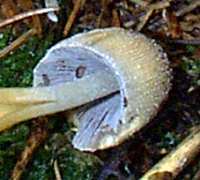 The suffix -ellus indicates fungi that produce rather smaller fruitbodies than those of Coprinus species. The specific epithet micaceus means 'similar to grains of salt (or mica)' and refers to the tiny granules (veil fragments) that glisten like specks of mica on the surfaces of immature caps. In wet weather these granules are sometimes washed away so that the surfaces mature caps become entirely smooth rather than granular. Covered at first in tiny white granules - the remains of the veil - the egg-shaped caps of Coprinellus micaceus become bell shaped and lose their salt-like grains of velum as they age. The caps are typically 2 to 4cm tall and of similar diameter when they open out. The cap colour is ochre-brown, with a russet central 'eye', and turns grey-brown as it ages. Glistening Inkcaps are somewhat hygrophanous: they change colour depending on whether they are dry or moist, darkening when the air is damp. The gills of the Glistening Inkcap are white, turning purple-brown and then blackening before deliquescing (autodigesting and becoming a black inky fluid). The white stem is brownish at the base, typically 2 to 5mm in diameter and 4 to 10cm tall. 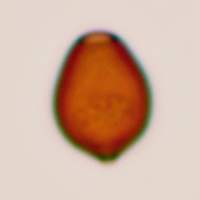 Ellipsoidal to mitriform (shield-shaped), smooth, 7-10 x 4.5-6µm; with a central germ pore. Saprobic, found growing on or beside broad-leaved tree stumps and dead roots. 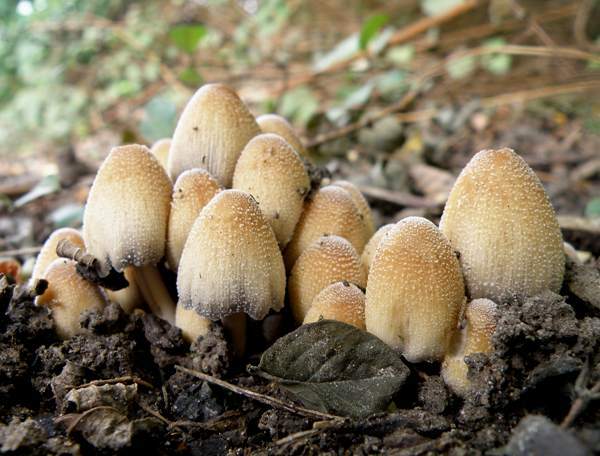 Coprinellus disseminatus also appears in large groups but does not have salt-like granules on its cap. The Glistening Inkcap is reported to be edible, but it is not highly regarded. Redhead SA, Vilgalys R, Moncalvo J-M, Johnson J, Hopple JS Jr.; Vilgalys, Rytas; Moncalvo, Jean-Marc; Johnson, Jacqui; Hopple, Jr. John S (2001). 'Coprinus Pers. and the disposition of Coprinus species sensu lato.'. 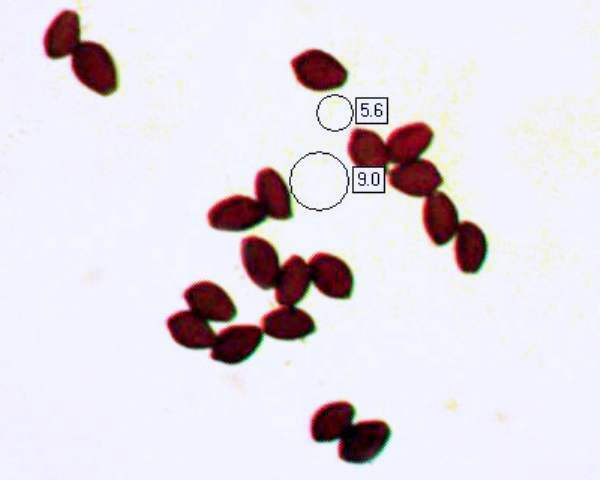 Taxon (International Association for Plant Taxonomy (IAPT)) 50 (1): 203–41.